Elizabeth Holmes has been given a 10-year ban from being an officer or director of a public company. (All the photos of her look like this.) Photo by Digital Spy on Flickr. A selection of 10 links for you. I can feel it going, Dave. I’m @charlesarthur on Twitter. Observations and links welcome. Theranos founder and chief executive Elizabeth Holmes surrendered voting control of her blood-testing company, paid a $500,000 penalty and agreed to a 10-year ban from being an officer or director in a public company in settling civil-fraud charges Wednesday with the Securities and Exchange Commission. The settlement follows a more than two-year investigation by the SEC prompted by revelations in The Wall Street Journal. In October 2015, the Journal published an article revealing that Theranos used its proprietary blood-testing technology for only a fraction of the blood tests it offered in Walgreens stores. The article also reported that former employees were leery of the technology’s accuracy. Theranos has since voided nearly one million test results, and Ms. Holmes agreed to a two-year federal ban from owning or operating laboratories. The company also has settled lawsuits from a hedge-fund investor and Walgreens, its former retail partner, alleging that it made misleading representations to them. Carreyrou wrote the original story in October 2015 casting gigantic doubt over Theranos. At the time, Theranos was said to be worth $9bn. A win for journalism. I don’t know how low Apple would feel comfortable cutting off support for the Series 0, but it certainly seems like it is a possibility. If I do some completely unscientific, wild, and almost certainly unreliable extrapolations of the current adoption trends (straight linear projection based on the trends since Christmas). It looks like by this fall, when presumably the next Apple Watch would be released and watchOS 5 will be generally available, the Series 0 may be as low as 15-20%. I’d be amazed if the next version of WatchOS supports the Series 0. 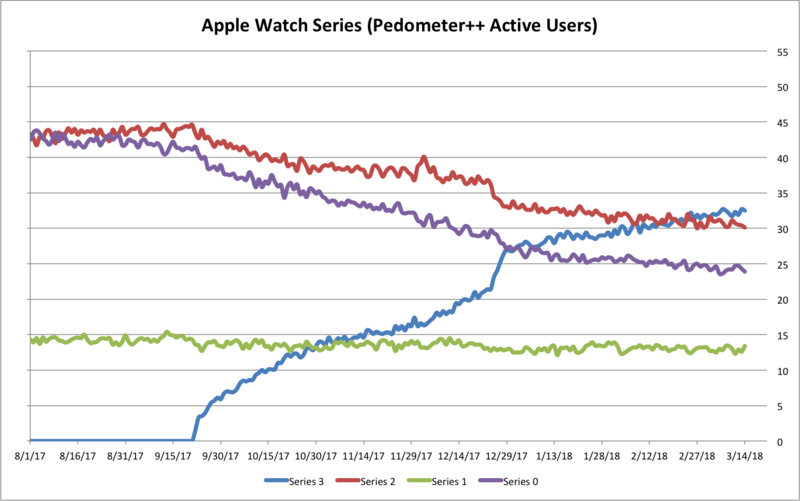 What that graph doesn’t depict is the expanding user base; the number of Series 0 users is probably pretty constant now, so the Series 3 users are really rocketing in numbers. Google will ban all adverts for cryptocurrencies, including bitcoin and initial coin offerings (ICOs), as it seeks to “tackle emerging threats”. Google said its ban includes cryptocurrency exchanges and wallets. The company will also begin blocking some gambling ads, such as those for services using virtual items worth real-world money, known as skins betting, as it seeks to “combat new threats and improve the ads experience online”. The move follows similar bans made by advertising rival Facebook, which banned all cryptocurrency and ICO adverts in January after finding that many were being used to scam potential investors. What none of the stories about this explain is why they’re waiting until June to do it. It’s March now. That’s three months of jolly scamming for the jolly scammers, who will surely ramp up their efforts knowing there’s a deadline. The Raspberry Pi Foundation has announced a new version of its modular compute platform: the Raspberry Pi 3 Model B+. The B+ has the same form factor and dimensions as the Pi 2 B and Pi 3 B, making it a drop-in replacement but with a better processor and connectivity. Compared to the Pi 3 B, the B+ adds many hundreds of MHz—it runs its quad core 64-bit Cortex-A53 processor at 1.4GHz, up from 1.2GHz—along with dual band 2.4/5GHz 802.11b/g/n/ac Wi-Fi and Bluetooth 4.2, up from 2.4GHz and Bluetooth 4.1. The Ethernet port has been upgraded from 100Mb/s to what is technically gigabit; it syncs at gigabit speeds, but the actual Ethernet controller is only USB 2, so transfer rates are limited to about 300Mb/s.Other connections are unchanged, four USB 2 ports, a 40-pin GPIO connector, an HDMI video output, camera and touchscreen ports, stereo/composite video, and a microSD slot for its software and operating system. It uses the same 5V/2.5A power as before and will also support power-over-Ethernet with an accessory (coming soon) sold separately. The faster processor and better networking don’t change the price: it’s still a $35 piece of hardware. Toys R Us is to shut all 100 of its UK stores, with closures beginning on Thursday after administrators failed to find a buyer for the collapsed retailer, resulting in the loss of 3,000 jobs. The chain’s administrators said the group would be extending a nationwide discounting programme and encouraged shoppers to “take advantage of special offers while stocks remain high”. On Wednesday, staff were told that no buyer had been found for Toys R Us and that all stores would close, with 67 staff at the group’s head office in Maidenhead, Berkshire, made redundant. This isn’t the US arm (that was yesterday). Potential investors were told in February they would need to put in at least £120m to prevent liquidation. But if you were going to try to sell toys now, would you open 100 big retail stores on high streets, malls and out-of-town centres? British retail is having a bad time. On Tuesday, however, YouTube CEO Susan Wojcicki detailed a potential solution. YouTube will now begin displaying links to fact-based content alongside conspiracy theory videos. Wojcicki announced the new feature, which she called “information cues,” during a talk with WIRED editor-in-chief Nicholas Thompson at the South by Southwest conference in Austin, Texas. Here’s how it will work: If you search and click on a conspiracy theory video about, say, chemtrails, YouTube will now link to a Wikipedia page that debunks the hoax alongside the video. A video calling into question whether humans have ever landed on the moon might be accompanied by the official Wikipedia page about the Apollo Moon landing in 1969. Wojcicki says the feature will only include conspiracy theories right now that have “significant debate” on the platform. YouTube (and Google) keep dancing around this subject, but it’s going to bite them hard soon. People get information from YouTube. A lot of that information is just plain wrong. Adults who know better point out that that information is wrong, and they lower their trust, and the trust they offer, in it. Viewers lose trust, advertisers lose trust, it’s a downward spiral. As a solution, this is also stupid, and – one hopes – short-term. As Mike Isaac pointed out, you don’t solve the problem of an infinitely gameable platform by fact-checking it from a service that literally anyone can edit. Is Wikipedia prepared for the edit wars that will naturally follow from this decision? It’s another example of Google offloading the work of checking content onto someone, anyone, else. London mayor Sadiq Khan, a frequent target of Britain First, praised Facebook’s action. “Britain First is a vile and hate-fuelled group whose sole purpose is to sow division,” Khan said in a statement. “Their sick intentions to incite hatred within our society via social media are reprehensible, and Facebook’s decision to remove their content is welcome. “The global tech revolution has brought incredible benefits and social media is enjoyed by billions of people around the world. But big social media companies must wield the power they’ve amassed responsibly. Matthew Collins, the head of research at social media advocacy group Hope Not Hate, also praised Facebook’s decision. “Britain First used Facebook as a means to leverage its position and push out some of the most divisive and vile anti-Muslim hatred you could find online,” Collins said. A Russian chemist who helped develop the Soviet-era nerve agent used to poison a former Russian double agent in southern England said only the Russian government could have carried out the attack with such a deadly and advanced toxin. Vil Mirzayanov, 83, said he had no doubt that Russian President Vladimir Putin was responsible, given that Russia maintains tight control over its Novichok stockpile and that the agent is too complicated for a non-state actor to have weaponized. “The Kremlin all the time, like all criminals, denying – it doesn’t mean anything,” Mirzayanov said in an interview in his home in Princeton, New Jersey, where he has lived in exile for more than 20 years. Sergei Skripal, a former Russian military intelligence agent who betrayed dozens of Russian agents to British intelligence, and his daughter are fighting for their lives after they were found on March 4 collapsed on a bench, having been poisoned with Novichok, according to British authorities. British Prime Minister Theresa May said on Monday that it was “highly likely” that Putin was behind the attack, a charge Russia denies. The Securities and Exchange Commission on Wednesday charged a former chief information officer of a U.S. business unit of Equifax with insider trading in advance of the company’s September 2017 announcement about a massive data breach that exposed the social security numbers and other personal information of about 148 million U.S. customers. Well now. This is going to be a good one to watch. If Ying really acted on this information (and the SEC cites some of his web searches which are verrry suspicious), he must have thought that the share price was going to absolutely crater – where in fact it seems more like a 10% fall. If he’d had the opportunity to read my forthcoming book Cyber Wars, about high-profile hacking incidents, he’d know instead that companies’ share prices usually aren’t affected in the long term by hacks. Errata, corrigenda and ai no corrida: when I said yesterday that the “Strava bike theft” was a story that went back some years, I’d forgotten that I linked to exactly such back in October 2015.